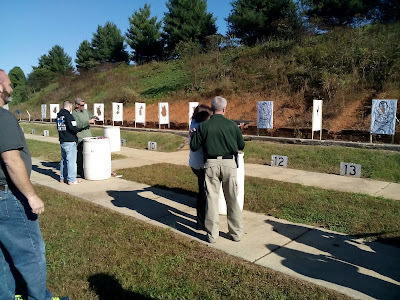 On Range Day, we were able to fire three different weapons that are in the KPD inventory, a .45 ACP SIG P220, a 12 gauge pump shotgun, and an M-16 with a 3-round burst selector. I was waiting my turn to shoot the rifle, which I had assumed was a semi-auto AR-15. The lady ahead of me shot, and I was surprised to hear instead of hearing a single BOOM, a RAT-TAT-TAT. Here is a good place to note the difference between the action types available on the AR-15 genre of rifles. fully automatic, also known as machine-gun mode; the gun fires as long as the trigger is pressed, or it runs out of ammunition. The 3-round burst is a variation of the fully automatic, it fires three rounds with each press of the trigger. Then the shooter must release the trigger, before engaging it for another three round burst. AR-15 - This is the rifle that has become the most popular rifle in America. It is of the same size and shape as the M-16/M-4, but it shoots only in the semi-automatic mode. The semi-auto action was invented in the late 1800's and has been used in rifles, shotguns, and handguns ever since. One more note on machine-guns, which are thought by many to be illegal for the average Joe. They are actually quite legal to own by anyone who can legally own a firearm. 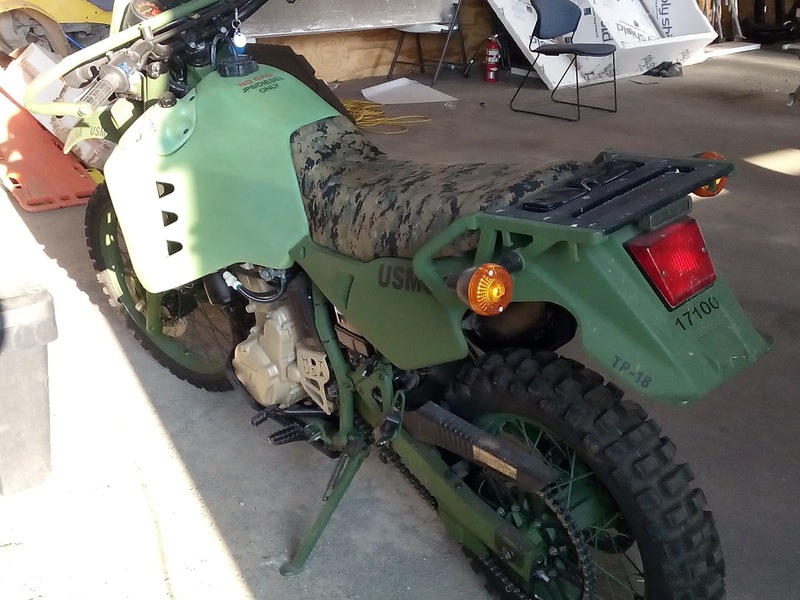 The owner must, however register ownership with the Feds and pay a $200 transfer tax when purchased. Due to a legislated scarcity, these legal guns are quite expensive, costing tens of thousands of dollars. One might call them rich men's toys. 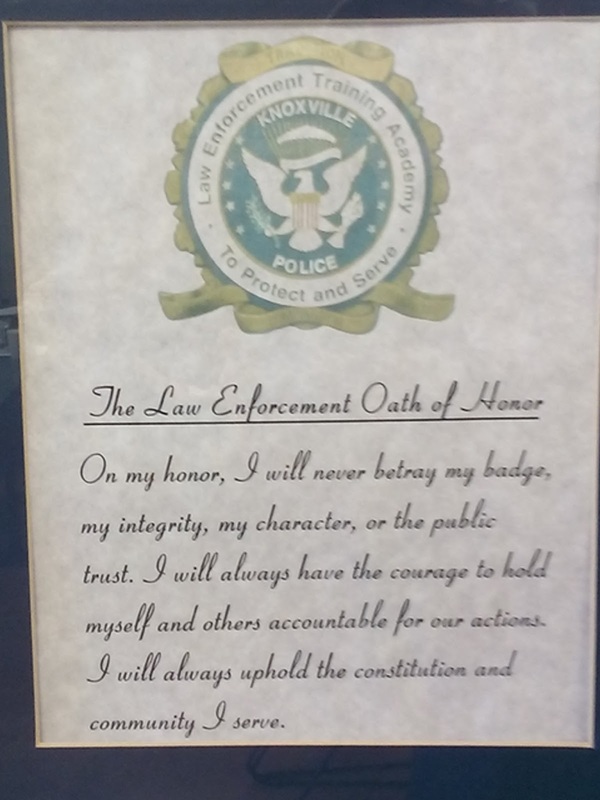 The Law Enforcement Oath of honor is displayed on the wall of a classroom. I believe that most officers do their best to live up to the oath - but here's a note to all officers: Part of your oath is to "uphold the Constitution." The Constitution is not a smorgasbord for you or me to pick from, but a complete package, including all the Bill of Rights. Decide today what you will do if you are ever ordered to participate in a general confiscation of firearms from peaceable citizens. . . . I made a few short videos of some of our experiences on range day in the class. The first was of a ride in a cruiser on an enclosed track. Now, that was fun! Here we are with the Bomb Squad, blowing up a piece of DETCORD. Here we are with the explosion of TNT. Watching the SWAT Team make a dynamic entry. Fast, coordinated, with live ammo! Officer Willson helping a classmate with the pump shotgun. As can be seen, the recoil is noticeable, but not terribly bad with the loads we were shooting. 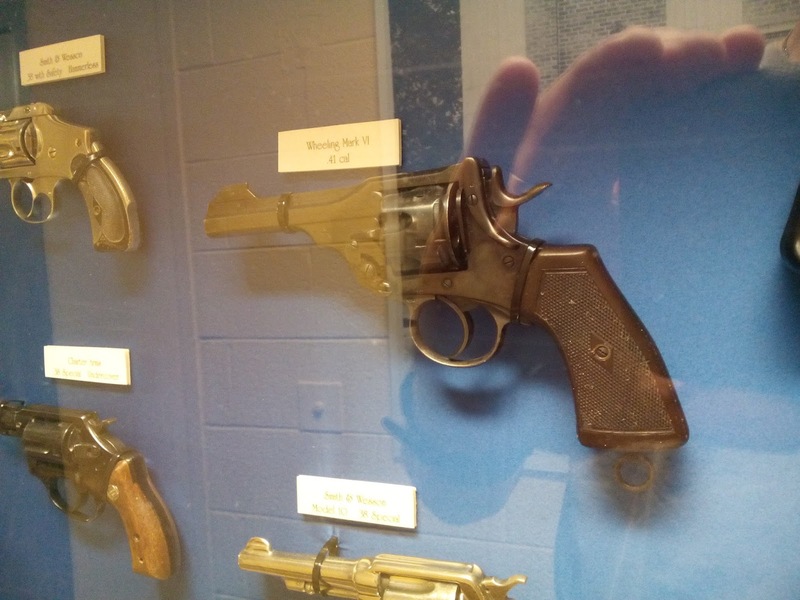 The KPD has a museum in police headquarters. 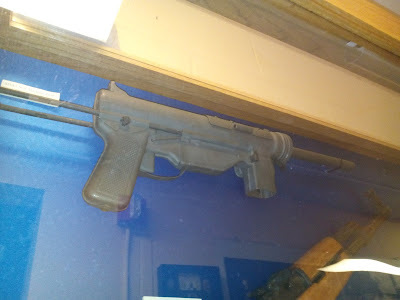 One of the interesting guns on display is the WWII vintage M3 Grease Gun, so named for its resemblance to the automotive grease gun. This gun shoots the same .45 caliber ammo issued to KPD. It was designed to be a low cost, easily manufactured replacement for the Tommy Gun. The British have a reputation (at least in my mind) for producing odd looking, but functional firearms. Here, for example, is the Webley revolver. Louis Monroe was our class president. 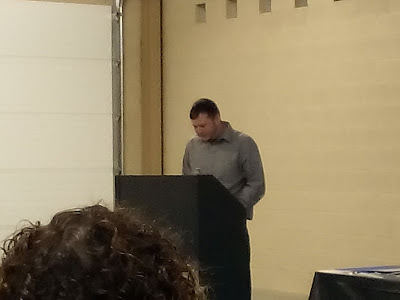 His speech at our graduation ceremony was outstanding! Here are a few takeaways from the class. I believe most officers are dedicated professionals. They work hard, enduring all weather extremes. In spite of very trying circumstances they do the job, and do it very professionally. With that in mind, it is important for us as citizens to recognize their positional authority, and give proper respect to this thin blue line that is often the only thing standing between us and evil. Don't be stupid when interacting with them. If you have reason to believe they are acting beyond their authority, get the officer's name and badge number, and make your complaint later to the appropriate agency. Don't get into a fight with the police. Society expects them to win, and win they must. Again, don't be stupid. The police are relatively few compared to the population. That's a good thing, because we don't want a Police State. If you have an emergency, they will come, but it will take ten minutes or more in a urban area. What will you do pending their arrival? Better have a backup plan. In times of great emergency (think Hurricane Katrina or Hurricane Sandy), they may not be able to come at all. What's your plan? The Knoxville Police Department's Citizen's Police Academy was well worth attending. If you are interested in attending a future class, contact Officer Adam Willson, who did an excellent job of coordinating the class. Thanks a bunch, Adam 12. 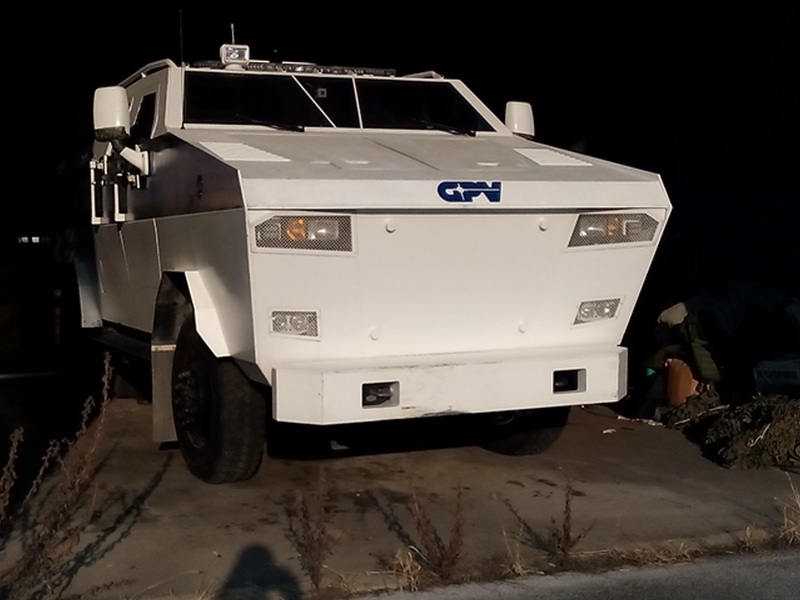 What a great look at some behind the scenes efforts that take place to protect our community. Thanks Liston for putting this article together and taking the time to complete the course. Is it the Civilian Police Academy or the Citizen's Police Academy, you refer to it in both ways. As police are nothing more than civilians, what is the distinction between this and the police academy?